Healthcare, group living and housing experts have returned to the proverbial drawing board after putting last year to bed. This year is packed with conferences and industry gatherings for professional buyers, architects and planners. Now that the New Year is firmly underway, these experts have started letting the industry know about what they expect to see in terms of contract furniture trends for the upcoming year. Design trends in contract furniture are pointing towards contemporary styling with clean lines, deep seats, simple decorative elements and solid looks. The coming year’s most popular styles encompass the elegance and simplicity of Danish modern furniture (popular in the early 1900’s) with visibly solid, heavy-duty frames. Upholstered seating trends continue to incorporate slim legs and practical arms that are often enhanced with small amounts of shiny chrome or rich-toned polished wood. Popular occasional seating includes sturdy, wide backs and seats – sometimes embellished with bold colors and materials – and uses lean wood or metal legs with wide stretcher bars that make these chairs look extremely substantial and inviting. 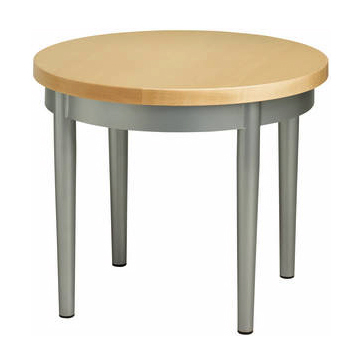 Dining and occasional tables are also marrying warm woods with bases of sleek, polished metal. The most fantastic part of these trends is that durability is part of the fashion and the most trending furniture not only looks solid and beefy but it performs that way too. Form and function have not always intersected as nicely as do in 2013’s most popular furniture trends. ost to any color scheme. In fact the rich, jewel-toned emerald green has been voted the color of the year for 2013! Monochromatic color pallets of varying hues is certainly the most distinctive trend for the upcoming year with many buyers opting to furnish multiple seating areas with one, unifying fabric on all pieces. Patterned fabric has become less appealing although textured solids are still a fan favorite. Even vinyls, once the ugly step-child of the contract furniture industry, are regaining popularity due to their recycled and green content as well as its naturally stain and soil resistant surface. Combining both the style and color trends, what you can expect to see are sofas and chairs with dramatic, straight-lined silhouettes; deep, often curved seat backs; monochromatic upholsteries; accents including arm caps and slim legs of polished wood and chrome; all with a look that shouts substance, durability and function. Complementing occasional tables and chairs echo the slimmer lines and use of metals and warm woods. Color pallets will be grey and still blue and then green, and the combination of pale blue and gold.
. When planning your furnishing project, always consult with a contract provider who understands the needs of your facility, consumers and staff. Happy 2018!